This data set provides global monthly wetland methane (CH4) emissions and uncertainty data products derived from an ensemble of multiple terrestrial biosphere models, wetland extent scenarios, and CH4:C temperature dependencies. The data are at 0.5 by 0.5-degree resolution. Two model output data products are included in WetCHARTs v1.0: an output from the full ensemble for 2009-2010 and an output from a limited subset for 2001-2015. The intended use of the products is as a process-informed wetland CH4 emission and uncertainty data set for atmospheric chemistry and transport modelling (WetCHARTs). The two data products are provided in netCDF format files (.nc4). Figure 1: Global monthly 0.5-deg by 0.5-deg wetland methane emissions from (a) the full ensemble (2009-2010) and (b) extended ensemble (2001-2015). From Bloom et al. (2017). This data set provides global monthly wetland methane (CH4) emissions and uncertainty data products derived from an ensemble of multiple terrestrial biosphere models, wetland extent scenarios, and CH4:C temperature dependencies. The data are at 0.5 by 0.5-degree resolution. Two model output data products are included in WetCHARTs v1.0: an output from the full ensemble for 2009-2010 and an output from a limited subset for 2001-2015. The intended use of the products is as a process-informed wetland CH4 emission and uncertainty data set for atmospheric chemistry and transport modelling (WetCHARTs). Detailed descriptions of the ensemble approach and results validation can be found in Bloom et al. (2017). The NASA Carbon Monitoring System (CMS) is designed to make significant contributions in characterizing, quantifying, understanding, and predicting the evolution of global carbon sources and sinks through improved monitoring of carbon stocks and fluxes. The System will use the full range of NASA satellite observations and modeling/analysis capabilities to establish the accuracy, quantitative uncertainties, and utility of products for supporting national and international policy, regulatory, and management activities. CMS will maintain a global emphasis while providing finer scale regional information, utilizing space-based and surface-based data and will rapidly initiate generation and distribution of products both for user evaluation and to inform near-term policy development and planning. Bloom, A. A., Bowman, K., Lee, M., Turner, A. J., Schroeder, R., Worden, J. R., Weidner, R., McDonald, K. C., and Jacob, D. J.: A global wetland methane emissions and uncertainty dataset for atmospheric chemical transport models (WetCHARTs version 1.0), Geoscientific Model Development, accepted, 2017. There are two data files in netCDF format (.nc4) with this data set. The file names and general descriptions are provided in Table 1. The NetCDF files are self-describing and follow Climate and Forecasting (CF) metadata conventions (http://cfconventions.org). The CF standard provides an internal description of each data variable represented, and the spatial and temporal properties of each file. Bloom et al. (2017) have constructed a global wetland CH4 emission model ensemble for use in atmospheric chemical transport models (WetCHARTs version 1.0). The mean full ensemble and mean extended ensemble wetland emissions data were compared against a range of independent wetland CH4 regional emission estimates (Bloom et al., 2017). This process-informed wetland CH4 emission and uncertainty data set for atmospheric chemistry and transport modelling (WetCHARTs) is based on multiple terrestrial biosphere models, wetland extent scenarios and CH4:C temperature dependencies. The wetland CH4 emissions statistics within each 0.5°×0.5° gridcell are derived based on a 324-member ensemble of wetland CH4 emission simulations that are based on satellite-derived surface water extent and precipitation re-analyses, heterotrophic respiration simulations and temperature dependence parameterizations for the period 2009-2010 and a subset based solely on precipitation and the data-constrained terrestrial carbon cycle analysis derived for the period 2001-2015. The mean of the full and extended model ensembles was incorporated into GEOS-Chem and the model outputs have been compared against a suite of regional flux estimates. 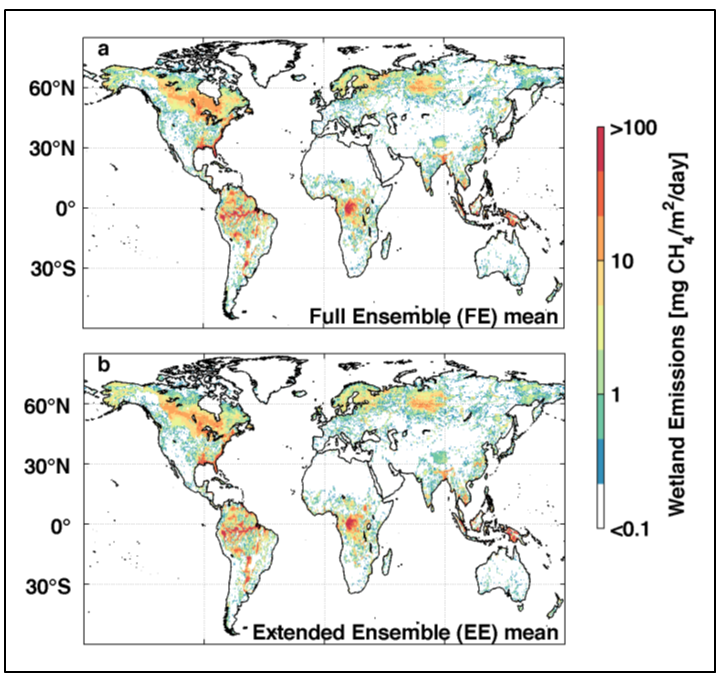 The wetland CH4 emission ensembles robustly represent the global magnitude and uncertainty of wetland CH4 emissions. The ensemble configurations of inundation extent, carbon decomposition and temperature dependence have together provided a characterization of the dominant source of uncertainty in global wetland CH4 estimates and can then be used to quantify (a) the probability of individual ensemble members; and (b) the combined probability distribution of carbon models, CH4:C temperature dependencies and wetland extent scenarios. For additional details see Bloom et al. (2017).